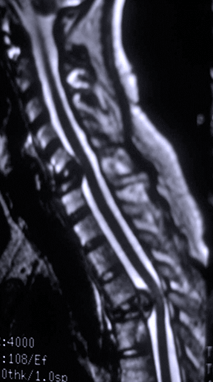 Spinal (vertebral) tumors are either Primary (arising from the vertebra itself) or Secondary/Metastatic (arising from a location other than the spinal column) and can cause either neurological symptoms and/or spinal instability that results in pain and can also cause paralysis from spinal cord compression from tumor or collapse of the spinal column. They may require multiple modes or combinations of treatment that include surgery, radiation and chemotherapy. Surgical treatment may be limited with laminectomy or major reconstruction depending on the specific situation. Dr Johnson has extensive experience treating these highly variable disorders and had developed many currently used technologies and procedures currently used. 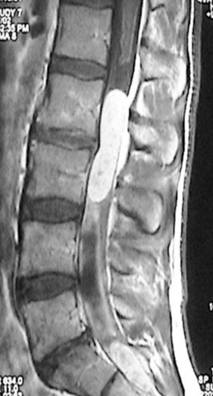 Fineman I, Johnson JP, Sandhu H: Renal failure and brown tumors in the spine. Journal of Neurosurgery:Spine 90(4):242-246, April 1999. Large meningioma located anterior to the spinal cord in the cervical spine. 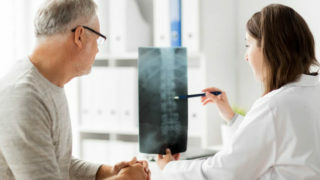 Spinal tumors involving the spinal column, spinal cord and nerves are uncommon disorders and few centers have experience for these typically complex problems. The most common types of nerve and spinal cord tumors are astrocytomas, ependymomas, schwannomas, and meningiomas. 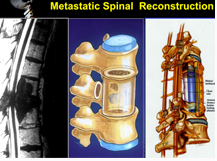 Other tumors involving the spinal column are metastatic tumors, sarcomas, chordomas and an array of rare pathologies. The treatment of these cases are either involving delicate microsurgery of the nerves and spinal cord or complex reconstruction of the spinal column if there is spinal instability from spinal tumors causing destruction of the spinal column. Some cases will require both microsurgery and reconstruction and Dr Johnson has some of the most experience in the Western US in all aspects of these problems. 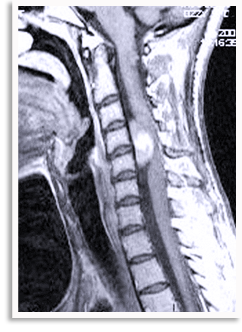 Images: Large ependymoma in the lumbar spinal canal. The large size is due to slow growth and displaces the nerves without significant symptoms. Intraoperative picture of a lumbar tumor intertwined with the nerves before removal.